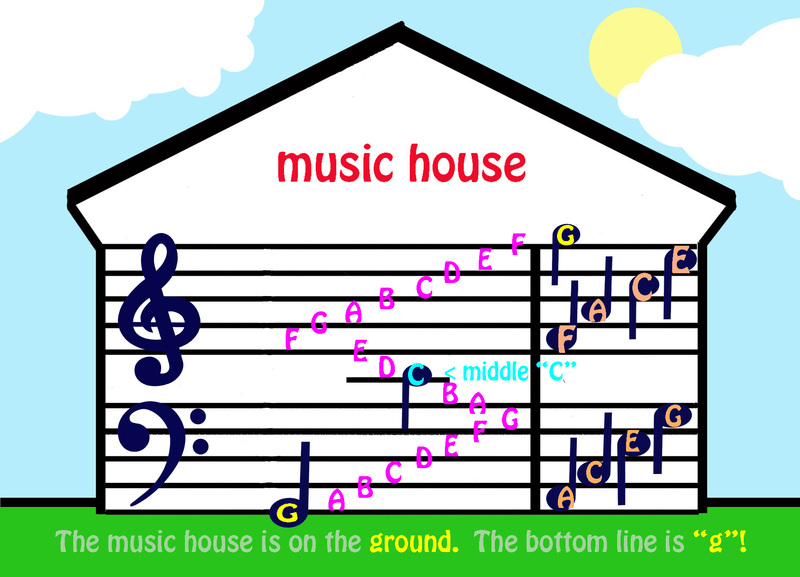 The squiggly symbols in the “music house” above are called “clefs”. The word “clef” means “key”. Remember, all houses need a key to enter! So there is always one at the beginning of music, too. Memory Aid: Both “treble” and “top” start with “t” in their spelling. The treble’s on the top! Memory Aid: Both “bass” and “bottom” start with “b” in their spelling. The bass is on the bottom! You can recite the following in a sing-song manner to help you remember this lesson. When you say “the treble’s on the top” use a high voice. When you say “and the bass is on the bottom”, use a low voice. And in the middle, there’s a “C” – with a line through it!